Size Exclusion Chromatography (SEC), also referred to as gel-filtration chromatography when used with aqueous mobile phases, uses porous particles to separate biological molecules of different sizes. The advantages of this method include good separation of large molecules from the small molecules while preserving the biological activity of the particles to be separated. 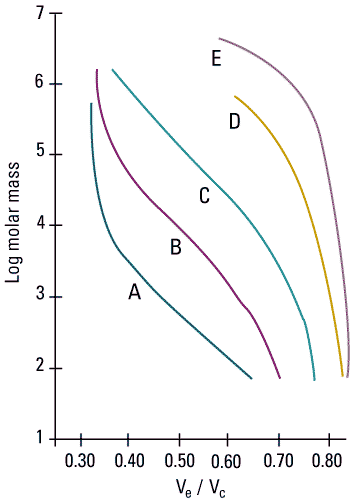 Proteins larger than the pore size cannot enter the pores and will thus co-elute as the first peak in the chromatogram. These molecules are said to be totally excluded from the pores. Proteins that at least partially enter the pores will have varying residence times dependent on their hydrodynamic radius. 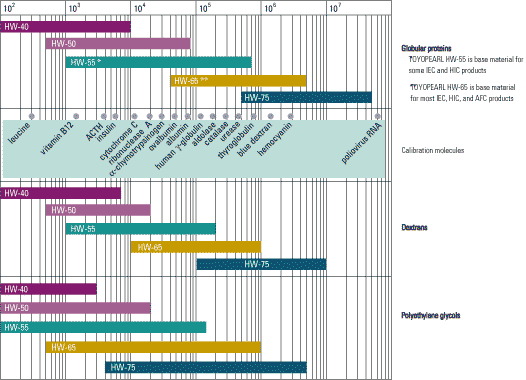 Different proteins will therefore have different residence times when passing through the column. Molecules that are smaller than the pore size are able to enter all of the pores in the resin and will therefore have the longest residence times. These molecules typically elute together as the last peak in a chromatogram. The main applications of size exclusion chromatography are desalting of the feedstock, removal of aggregates in a final polishing step and virus purification. In general it can be used to fractionate and purify synthetic and biological polymers, such as proteins, polysaccharides and nucleic acids based on size. The technique is generally combined with others that further separate molecules by other characteristics, such as pI, charge, and affinity for certain compounds and is typically used as a polishing step. TOYOPEARL and TSKgel chromatography media are polymer based macroporous resins for biopurification. Their rigid polymer backbone has better pressure-flow properties the most other commercially available materials. This simplifies column packing and allows for higher operating velocities thereby increasing throughput and decreasing recycling and sanitization times. TOYOPEARL HW and TSKgel PW size exclusion resins are the base material for all of Tosoh's ion exchange, hydrophobic interaction, and affinity process media. After an initial polymerization reaction to create the designated particle size and pore size, the resin surface is chemically modified to create the final product. Each product is designed for a different molecular weight range and customer feedstock profile.